Colin Booth near his Hampshire home in recent months. It says everything about Wolves’ playing strength in their glory years that a player as talented as Colin Booth was never able to nail down a place for more than a dozen successive first-team games with them. And, even when he achieved that level of presence, the sequence straddled the end of one season and the start of the next. Booth not only helped the club win two League titles and collect some prize scalps from across the continent, he played a part in building the pedestal on which they sat for years. By enjoying his best season in 1955-56, when he appeared in 27 games in League and Cup, he was instrumental in keeping Stan Cullis’s side up with the elite and in a challenging position from which they able to push on for their two consecutive championship crowns. His most consistent run was late in 1955-56 and early in 1956-57; the ‘getting ready’ seasons, if you like, before Wolves eased aside Manchester United and went within a point of becoming champions for three straight years and claiming the 20th century’s first League and Cup double. The statistics tell us that, those epic floodlit nights apart, Booth played 82 Wolves games and scored 27 goals, including four in a 5-2 victory over Arsenal (still a joint record for any player against the Gunners) and hat-tricks at Sheffield United and at home to Portsmouth. Although his development was no doubt assisted by the splendour around him, it’s tempting to think how many more first-team opportunities he would have had if it hadn’t been for the severe competition provided at inside-forward by the likes of Peter Broadbent, Jimmy Murray, Dennis Wilshaw and Bobby Mason. His post-Molineux career emphasises what a quality operator he was but more of that in due course….. Towards the of the 1950s, Wolves’ eclipse of United at the game’s summit carried extra resonance for Booth, as did the Munich Air Crash. His formative years were spent in and around Manchester, from where he skippered Lancashire Boys and earned rave reviews. “I played for Manchester Schoolboys and was captain when they reached the final of the English Schools Trophy and played Swansea,” he said. “Cliff Jones was their skipper. “We drew 1-1 there and had 20,000 watching when we brought them back to Maine Road. They beat us 1-0. They were a good side. 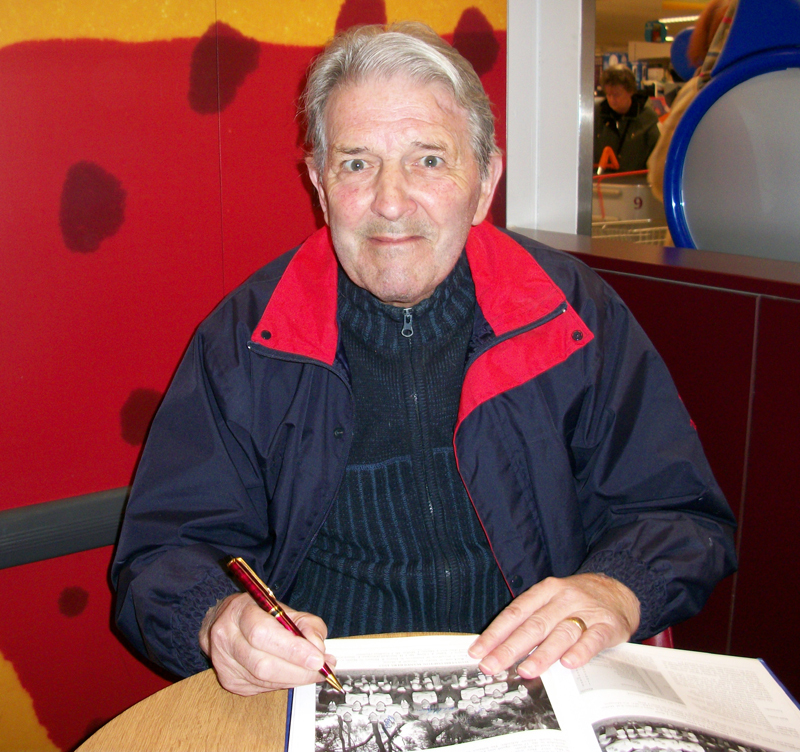 Dennis Viollett played for Manchester the year before……I played with him about three times in boys’ football. “Matt Busby wanted the whole team to go and sign for United but we split up and went our separate ways. My father suggested it was better for me to get away from home. That way, whether I made the grade or not, I wouldn’t have my mates pestering me for tickets. “As a boy, I used to go to Maine Road one week and Old Trafford the next, although there was a time in the late 1940s when United had to use City’s ground because their own stadium had been damaged by bombs during the war. 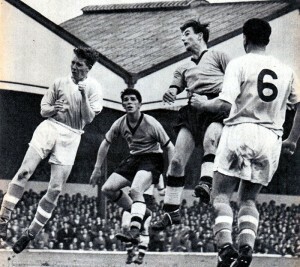 Booth watches Jimmy Murray - later to sign at Maine Road - head goalwards against Manchester City at Molineux in 1955-56. Booth had grown up watching plenty of City. Now 77 and living near Bournemouth, Booth smiles as he recalls occasional obstacles. “From 13 to 15, I went to Newton Heath Tech, where we didn’t play football if it rained, which it did quite often! We didn’t even play in a league; just friendlies. “I was a skinny little thing but I was reserve when England played Scotland at Wembley. Johnny Haynes was captain and Eddie Clamp was also in the side. I have a photo somewhere…..there were some six-footers towering over me. A lad called Malcolm Spencer was the left-back. He got in the side before Johnny. He was a good player, very tall, and went to Wolves but moved on to somewhere like Worcester City. “A scout from Wolves came to see me at our house in Middleton. They had watched me a few times. I went there and was on the groundstaff with Norman Deeley. “I played in the Wolverhampton Amateur League first. Our opponents seemed big guys when we were 16 and 17. You soon learned when to get rid of the ball but we were fitter and cleverer than they were. “Wolverhampton was 80 miles from home and I was lonely there in the first year. But I made it into the Worcestershire Combination team and remember when Ron Flowers was signed. He was a class act. Slater, Wright, Flowers was the best half-back line I ever saw…..I’m glad I played with them and not against them. “I remember we had to learn to kick with both feet. If you couldn’t, you had to do extra practice until you could. The only senior player who didn’t manage it long term was Jimmy Mullen and he was so good with his left that it didn’t really matter. “On the other wing, Johnny Hancocks was the best volleyer of a ball I ever knew. His timing was out of this world. I used to clean his miniature boots. 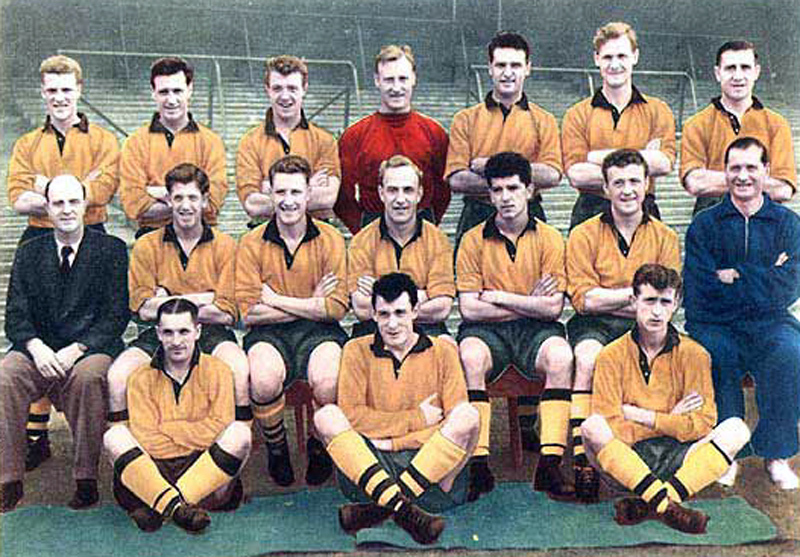 Cullis chided Booth – and maybe in not such a gentle way – when he failed to score any of Wolves’ nine goals in the famous rout at Cardiff in 1955. But the Iron Manager wasn’t his only critic. There were less than gushing words from his nearest and dearest even when he had netted three against Portsmouth the day after Wolves had hit five at Fratton Park. “Norman Deeley scored three on the same day that I did,” he added. “It was Christmas time and Peter Broadbent hit a hat-trick down there. After a home game, I often went into town for a meal with my wife Pam at a café and remember her saying that night that I hadn’t played very well! “My total of games for Wolves might not sound very high but you have to remember that Peter was always one of the first names on the team sheet and we had players like Roy Swinbourne, who had such bad luck, Jimmy, Dennis and Bobby Mason as well. I feel privileged that I played with such great players – and against some. “My dad took me to watch Stan Matthews at Blackpool when I was about 12 and it was one of the proudest days of my life when I first played against him. Stan told us that the closest man to him should jockey him and not dive in. He said something like: ‘You forwards can’t tackle, so just stand on his better side to make it harder for him to go past you.’ Impossible! He was such a genius. He was 20 years older than me but just drew you in and skipped round you. “John Charles played at centre-forward for Juventus when we played them….the best header of the ball I have known. And they were the best team I played against. My last club was Cheltenham and one of my games for them was against Hereford when John was with them. 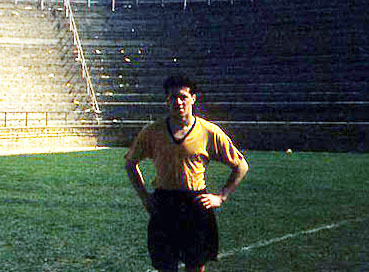 Colin on tour with Wolves in South Africa in 1957. Booth, who won one England under-23 cap (against France in 1956), well remembers the toppling of another football institution, Manchester United, in 1958. The 4-0 success at Old Trafford in the last but one match was the 13th of his 14 games that season – further evidence that he was so often in and out of the side – came after Wolves had clinched the title at Molineux. “There were no celebrations when we won there,” he said. “It was very sad. They had second and third-team players in their side after the disaster. They just had to get through their fixtures. I played in the remaining game as well, at Everton, but had to bide my time. “For several seasons, I didn’t feel impatient about not playing more. Besides, you didn’t make a fuss with Stan. He was a hard man as well as being very fair. “I was never a great player but you had to be decent to play even 20 games in Wolves’ first team then. When I went to Nottingham Forest, I played almost every one. “Eventually, there came a time I became unsettled and I told Stan I would like a move because I thought I needed to be playing more. “He said: ‘Look, Colin, I’d like to keep the squad together but I have never stood in the way of anyone who wants to leave.’ Four clubs came in for me – Sheffield Wednesday, Everton, Forest and Birmingham; all in the top flight. I decided on Birmingham but think Stan was happier that I joined Forest, so I went there. “They played a more controlled game than Wolves, who were more positive and got better results without playing such nice football. Forest had not long won the FA Cup when I went in the autumn of 1959. “I remember coming back to Molineux and playing centre-forward and being marked by Bill Slater. While I was running along the touchline, he came across and caught me from the side. He didn’t mean anything but he was a bit late and clobbered me. I went flying over the wall and landed on my back. How I didn’t break anything, I don’t know. “I had to play more up front at Forest and I had two years there, then two at Doncaster. I had played against Bill Leivers when he was at Manchester City and he was my manager at Rovers. I was on better money than anyone else in the Third or Fourth Division. “I averaged 25 goals a season at Forest and scored 62 in two seasons at Doncaster. It didn’t seem to matter much, though, because they were always at the bottom of the league. Later, at Oxford, I was captained by Ron Atkinson. I got 23 there and it mattered because we finished second in the table and went up behind Millwall. “But, in the following pre-season, we played a friendly at Reading and the keeper landed on top of me and made a right mess of my knee. I had ruptured my cruciate knee ligaments. It was a really bad injury and I didn’t kick a ball for 18 months. “I saw the surgeon and he advised me to think about going part-time because my knee wasn’t strong enough to train on every day. I got £1,000 compensation from the Football League and dropped into the Southern League. “Cambridge was a silly move, though. It was 80 miles even for a home match. Bill Leivers was there by now but I had a word with him and went to Cheltenham, which was only 40 miles from home. “I worked later in a hospital in Oxford, where I met my second wife Carol, and then one at Stafford, where she wanted to work in A & E. She was a nurse, a senior sister in theatre, and we moved after visiting the town for a cat show with my in-laws and noticing that the house prices were so low. 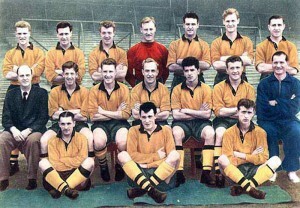 As he is most fondly remembered......two along to the left from trainer Joe Gardiner in a brilliant Wolves side. “We were in Stafford from 1988-1992 but always wanted to get to Bournemouth, which is the area Carol is from. We have been together now for 37 years. “I’m a long way from Wolverhampton these days but still follow football closely. And I met Bobby Mason when having a coffee in the Regent Hotel in Christchurch about 20 years ago. He was living round here then. Posted on: Wednesday, July 25th, 2012.